SteamPunk Glass: They’re Coming….. From Another Galaxy!!! 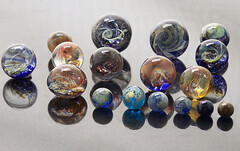 Well the news seems to be out, my next project is being unveiled….. Galaxy Marbles! Yes, for all those who think I’ve lost them, here is a sneak preview of some that I have been squirreling away at over past few weeks. I still have a few kinks to iron out, but I think I’m just about there now! I am hoping to start listing some for sale soon, please keep an eye on the blog here or even twitter http://twitter.com/SteamPunkGlass when I will announce their release. I have got the formula just about there now, and I got onto a great roll over this long weekend, with clearer definition and a lot less bubbles, more going on inside – I’ve been really getting excited about the results – until Easter Monday afternoon when my gas ran out! ARGH!!!!! Isn’t that always the way! For me this has been a long process of evolution, I’ve surprised myself at the techniques I’ve learnt and developed whilst doing this project. From basic implosion flowers this led on to twists and spirals, then the whole new complexities of boro glass colours. There is a huge amount of chemistry involved, not my strongest point either! Boro colours have a lot of heavy metals, often it seems in greater/more dangerous quantities than soft glass. I’ve had to rethink and improve my ventilation as well to work these. Some have high levels of chrome which when heated become gas, some of which can then re-form with the molten glass producing new glass within the glass. Doesn’t sound like a problem, until finding out the new glass has different expansion properties – which is why I have one marble with a great big split in it! I think it’s a testament to soft glassmakers that we have such a range of colours which we can use without too much thought about compatibility. I know there are a few that aren’t compatible and cause cracking issues, and we always moan when they do as it’s so frustrating when something toiled over breaks. Boro colours have only been around to artists since the early 1980’s, and clear Borosilicate is just over 100 years young, whereas soft glass has been around for thousands of years, so it’s hardly surprising it’s got the edge on reliability! Anyway, enough glass-geek talk, I need to go and take the long walk to the gas shop! WOW - those galaxies are fabulous! !